A diffused atmospheric light. Simple shade 05 makes a stunning focal point in an entrance hall or stairwell. A family of SS05 pendants in a dining room creates a dramatic impression. Simple Shade collection is the essence of a shade. One simple design with transformative properties in singular and multiple forms, Simple Shade features wide-brimmed sleek silhouettes and effortless grace. Using Japanese philosophy to mindfully design space and object as one. This is the only collection which completely collapses to a flat state. A clean look with an essential function. The crocheted lighting collections include simple and statement pendants. Luminescence and acoustics are enhanced by uniform stitching and quality of the fabric. Each piece glows with a warm Ambience, a result of the time, care and attention to detail invested by hand-making. Collaborating with internationally renowned architects and interior designers, Naomi Paul’s designs transform spaces into exceptional places. All our collection designs are made using 100% Egyptian mercerized cotton cord. Our pendants are made using Naomi’s signature mercerized cotton cord developed by the Naomi Paul Studio. The yarn is first spun and dyed in Italy before being knitted into the tensioned cable yarn in Lancashire. The dyed cotton yarn is Oeko-Tex certified which guarantees the safety of a non-toxic and hypo-allergenic product. All our pendants and shades are made to order in our London studio by our highly skilled team of makers. UL certified electrical parts are supplied by our North America partners, Color Cord Company. Parts are shipped separately to pendant deliveries. Items may vary to UK versions. Please note due to the handcrafted nature of our pendants height dimensions are variable. 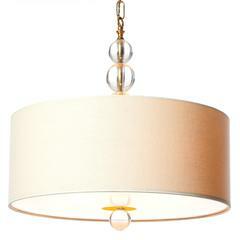 A beautiful plaster pendant light of circular shape, held by three adjustable brass chains. 1 Pendelleuchte aus Messing mit Löchern an der Unterseite von Lightolier, Amerikaner, 1950er Jahre. Das Messing wurde lackiert, damit es nicht anläuft.